thankful...and a sale (or 3)!! happy thanksgiving! i am spending today baking pies and stuffing myself with turkey surrounded by my family. i am so thankful for our ability to drive down and be with family. i'm thankful that my sweet nana is here for another year to share this day with us. i'm thankful for the relationship my husband and my dad have- they spent this morning out on a long bike ride together. i'm grateful that i can sit and write this in a warm house while we wait for more food than we need to be ready to eat. i'm thankful for a little sister who is going to brave toys r us with me tonight to look for a gift for my husband (yes...toys r us...for my 28 year old hubby!). i'm thankful for my parents who have hosted thanksgiving as long as i can remember. i'm so thankful for my sweet hubby who stopped to get me coffee after his ride today (none. in. the. house.) and thankful for the people at caribou who worked today so i could have that coffee. i've been there and working holidays was no fun (though tips were always better!). i'm also so thankful for the opportunity to be craftee mcgee and to run my little shop. i'm thankful for each person who buys from me to allow me to keep doing what i do. and this weekend i'm hoping to make it a little easier to buy from the shop. sale time! starting at midnight (pacific) tonight the black friday sale will go live. all day tomorrow you'll get 25% off your whole order with the code BLACKFRIDAY11. use it to buy that statement necklace you've been eyeing or one of my new cozy crochet products! all day saturday (and probably sunday too!) receive a free pair of charm earrings with any purchase over $20. just put the charm that you'd like in the message to seller and i'll add the earrings to your order. any charm earring in the shop is eligible and i can make earrings from any of the reCharm options! the free earrings offer is still available today! 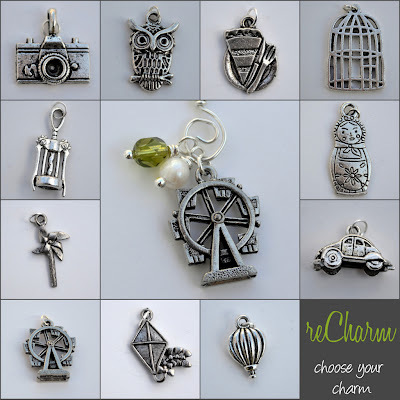 just enter your choice of charms in the message to seller! this month brandon has been growing out his 'stache to help raise money and awareness for men's health issues. i tried to grow a mustache of my own and failed (thank goodness) so i'm offering these fabulous mustache charm earrings. they're $8.50 shipped and 50% of the proceeds from these earrings will go directly to movember. i'm not putting them in the shop so that more of the money can go towards the cause so send me a quick note with your email address & i'll invoice you directly through paypal! just to help you plan your shopping the turnaround time right now is 4-6 business days and our Christmas Order Deadline is Monday December 12th. thanks to all who help keep this little shop running. i really am so grateful for each order. i'd know that silhouette anywhere! yes, it's true. i'm linking up for my very first what i wore wednesday over at lindsay's lovely blog. i keep meaning to link up but clearly i have a blogging problem (in that i don't blog) so here i am! when i saw a picture from this post floating around the internet somewhere (probably pinterest) i knew that this is who we needed to be for halloween! mary poppins is my favorite movie of all time. i have the whole thing memorized and could watch it over and over. my mom used to rent the movie AND a VCR so that i could watch it because i loved it so much. 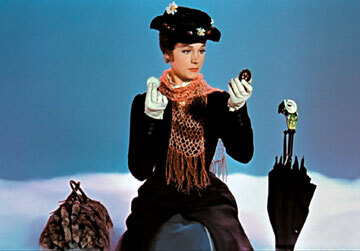 between mary poppins and the sound of music, julie andrews was my hero by the time i was 8! i can't believe i have never thought to dress as mary before! when i first saw the inspiration photo i thought this would be an easy costume because so much of mary's outfit (and bert's) are staple wardrobe pieces. i had black tights & shoes, the white shirt and a black coat. i happened to have a vintage grey wool skirt that i had picked up at goodwill a while ago that fit the outfit perfectly! brandon already owned a black shirt & pants and a vest. easy. the thing i had forgotten about were all of mary's many accessories. 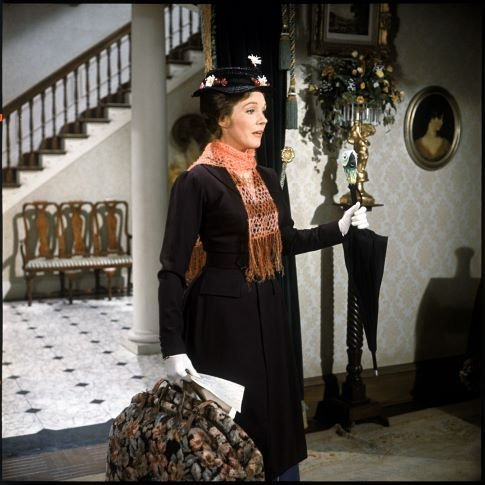 you can't be mary without a black hat or a carpet bag. and the parrot! i searched high & low for just the right black hat and couldn't find one! this hat was a big, wide hat that i cut down to be the perfect size. i glued on the ribbon and some berries (spray painted) and daisies from the dollar store. my original plan for the gloves was to bleach the gloves i wore to prom, but they didn't bleach. so instead of wearing green gloves, i found these wool gloves at the last minute at goodwill. "to carry carpets in?" "no, made of"
carpet bags are very hard to find! i ended up finding a bag just the right size and shape at...where else...goodwill! and the fabric was from an earlier thrifting trip. i killed me to cut the piece i got in half. the roman numerals on the selvedge tell me this gorgeous fabric is from 1965. i was able to cut it directly in half and attach it temporarily to the bag so i could use it again. not sure what it will be, pillows maybe? the bow tie was a simple little red piece of ribbon. i glue a safety pin on when i glued the center strip. that helped me pin my ruffly shirt closed to look like it had a high collar. and of course i couldn't stop there! i needed a scarf. a real, lacy, open mary poppins scarf so i ordered some perfectly shaded yarn & started to crochet. unfortunately i didn't start until a couple days before halloween and tiny hooks & lace weight yarn take forever. my scarf was much narrower & shorter than i would have liked but it definitely looked like mary's! i think i'll add to it since i still have two cones of yarn! and last but not least the umbrella! i was kicking myself for not buying the umbrella when i went to the broadway show in chicago last year, but since i didn't i had to make my own! i found a plain black umbrella for $5 at walmart. (yes we really only have walmart and goodwill up here. also a kohl's, but it was out of the halloween budget!). i grabbed some felt from my stash and cut out this little parrot based on a sketch i found online of the original movie prop. i sewed it together and stuffed it with a handfull of fiberfill. he got stuck to the umbrella handle with electrical tape and then i added the beak, eyes and feathers with more felt. this guy might be my very favorite part of the whole costume! here we are! my handsome chimney sweep and i! i think he should wear that hat all the time! we went to the lion's club party in town but arrived just too late for the adult costume contest. sad. the sweet old guys from the lions liked our costumes so much they gave us bags of candy! we enjoyed the rest of our night trick or treating with some friends & their kids and then finished the night at a party. halloween should not be on a monday! i think julie would be proud! and i might have to start wearing this on a regular basis. or at least carrying the umbrella!